The Foundation, through the Isdell: Flowers Cross Border Malaria Initiative, works closely with the Anglican Church, relying on church networks as an entry point for reaching last mile communities. 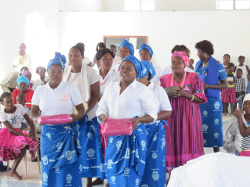 Specific partners include: Zambian Anglican Council; Anglican Diocese of Matebeleland; Anglican Diocese of Angola; Anglican Diocese of Namibia-Anglican AIDS Programme. The Church and spirituality play a central role in the day-to-day lives of communities where we work. Every member of the community is a member of a congregation and the clergy occupy a position of respect with moral authority to direct and educate their congregations on health needs as well as spiritual needs. Mobilizing and building the capacity of the clergy and leaders of the church is fundamental to communication and advocacy. Clergy go through a malaria training and integrate the information into sermons and community events. The Initiative works closely with the national governments and Ministries of the four countries in which it operates (Zambia, Angola, Namibia and Zimbabwe in an effort to harmonize all activities with national strategies and to secure buy in and cooperation for cross border activities. The J.C. Flowers Foundation, through the Isdell:Flowers Cross Border Malaria Initiative, works in partnership with the Anglican Communion through the Mothers Union that supports families worldwide. The Mother’s Union is the backbone of malaria elimination efforts in the border areas of Angola, Namibia, Zambia and Zimbabwe. A sustained and committed force, members of the Mothers Union volunteer their time and energy, functioning as community volunteers in areas affected by malaria.